Download the most recent snapshot. There is a tutorial under the doc directory (from root of the source tree) that (using recordings from my B.Sc. senior project) will take you from installation to testing under simulation. Be warned: the sensor stream dataset is large, 95 MB, and the link to it may change without notice until I find somewhere reliable and cheap to post it. This was originally developed as part of my honors senior project (see below, under ‘‘technical reports’’). It is free (open source) software and licensed under the GNU GPL, version 3. I am not currently working on it but will continue once I have my own robotics research equipment. However, the README files and example programs (and comments therein) should suffice to get you started. Please email me with questions, comments, etc. Note that this work is purely experimental and unversioned… essentially, in a pre-alpha state. It is released without any warranty whatsoever. 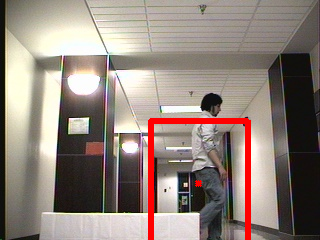 An example of vision tracking using my implementation of kernel-based object tracking, which is originally developed and demonstrated in (Comaniciu, Ramesh and Meer, 2003). Results from a box-pushing experiment. See my May 2009 report for details. 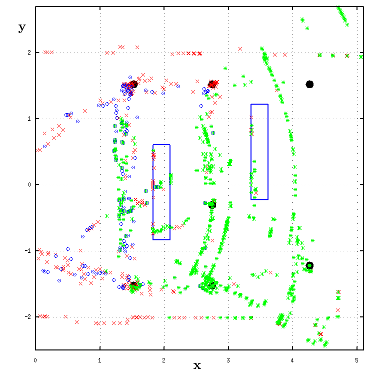 D. Comaniciu, V. Ramesh, and P. Meer, “Kernel-based object tracking,” IEEE Transactions on Pattern Analysis and Machine Intelligence, vol. 25, no. 5, pp. 564–577, May 2003. Page generated 2014-12-01 01:47:25 EST, by jemdoc.